There are tons of different income revenues that you can use as a blogger including ads, affiliate income, products, and sponsors. Remember, when you got the first product to review on your blog for free and you thought you made it? The first product I got was a book to review and I thought, yes, I’m finally a blogger, lol. Then you learned that writing those reviews for a $10 product just wasn’t worth it anymore. You start with Adsense ads and Amazon affiliate links and you are thrilled when you earn your first dollar with Amazon Associates. You then realize that they don’t pay out anything until you’ve reached the $100 threshold. While you’re getting tons of clicks, you’re not getting any more purchases and you question what it is you’re doing wrong. You’re spending hours on content, Facebook, Pinterest and who knows what else only to have your traffic stay stagnant while you’re earning pennies a day. Not exactly what you had in mind. As you begin to grow your email list, you’ll have some options as to how you’d like to use it. You want to nurture your email list so that you gain their trust. You don’t want to spend all of your time selling to them or else they will unsubscribe. 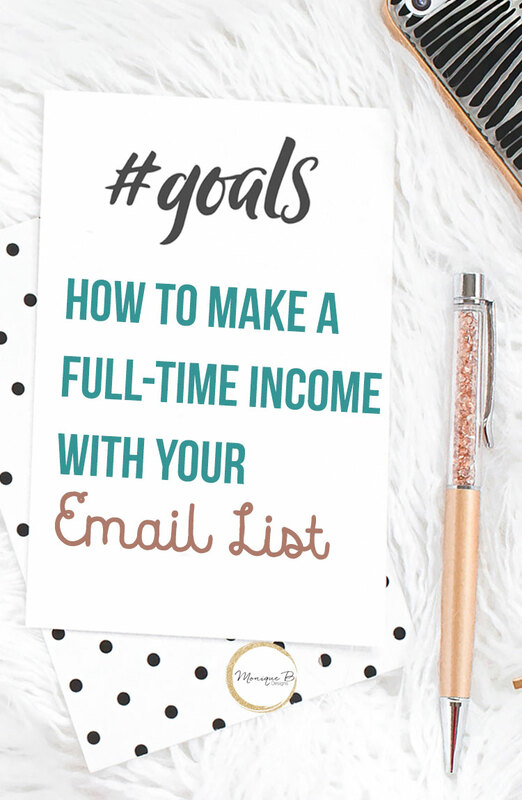 There are various ways to use that email to generate an income so that it pays for itself and more. People are always hesitant to start paying for an email service provider when their blog isn’t making any money yet, but Mailerlite is free up to 1000 subscribers. That’s who I suggest to new bloggers to keep costs low until you start making money with your site. You need thousands of followers on Pinterest or Facebook to only get a handful of people to see your content let alone click on the link to actually get back to your site. Email is the best way to grow your income significantly. When you have a good sized email list, you’ll be able to send them to your new or popular blog posts and have their visits count towards your ad revenue. This will continue to climb as you build up your email list. Every day you will gain new subscribers and when you send out a weekly newsletter, they’ll all flock back to your site with just one email. Don’t have your own product? No problem, find good quality affiliate programs to join and promote their products in your email as if they were your own. You will have much higher conversions from email than your blog posts or social media posts. Your email list can be surveyed so that you can find the right product to create for them. If you have a product idea, they can help you validate it before you create something no one wants. When you get a large number of email subscribers, you’ll be able to sell email ad space or eblasts to sponsors. Bloggers typically charge $25/1e00 subscribers for eblasts from brands. Just be sure that the brand is in line with your audience and that you’re not just selling ad space for the money alone. Once you have our own products, you can set up evergreen sales funnels that will promote your products to new email subscribers and get sales in a passive way. Sales funnels can be tweaked but it is said that readers need to hear about a product 11 times before they make a purchase so sales funnels are the perfect tool to sell your product. The beautiful thing is that once you set it up once, you don’t have to do it again. There’s a reason why people say you should make your email list your #1 priority, it works. Once you start to make an income, I suggest using Convertkit, their automations and segments are easy to use and set up. This is a great article. Many forget that email subscribers are actually the currency in the blogosphere. Without email subscribers, your blog is not that worth it. And now with all the GDPR and more email rules around growing email lists, it is even more important to have a large and active email list of subscribers. I like to call them “traffic-on-demand” as you can send them a blog post in their inbox and traffic to that article will skyrocket. That’s all if you are exceptionally good at what you do and you are not a spammy blogger, though. Email subscribers like to read and check the content they receive from trusted sources, and may even be willing to buy products and services based on their recommendations. Did you mean sell? Or is “see email ad space” something i’m not familiar with? Yes, that’s correct, I fixed my spelling mistake, it’s definitely sell.